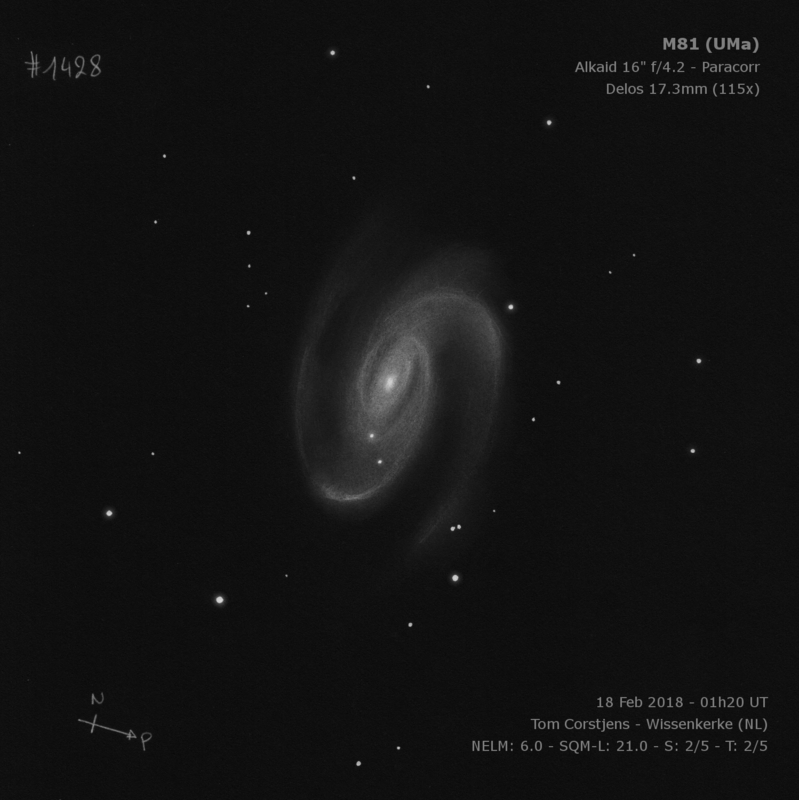 M81 / Bode’s Galaxy by DeepskyLog user Tom Corstjens licensed by (CC BY-NC 4.0). Used by permission. “The combination of 16″optics and the transparent, dark sky in Oesterput provided a very contrast-rich representation of M81. The central, elongated core zone is bright. Averted vision detects the start of a spiral arm on the northern side and careful observation detects this arch continuing to spin along the west; near a close binary star pair the spiral arm looks a bit brighter and then fades into the background, between this first arm and the core zone there is a clear dark zone and on the other side there is also a similar dark cove; it is caused by the second spiral arm. This arm is best recognizable near two foreground stars in the central part: there is a beautiful, patchy arc that connects the weak outer spur with the inner region. Looking carefully, the broad core zone seems to contain two less dark curves that accentuate the position of the spiral.” Alkaid 16″ f/4.2 Dobsonian with Paracorr and 17.3mm Delos eyepiece. Copious notes in the corners of each sketch explain the object, orientation, location, date, seeing conditions and hardware used. All the sketches we’ve seen were made with an Alkaid 16″ f/4.2 Dobsonian with Paracorr to correct the coma from the fast mirror. The eyepiece is usually a Delos, Nagler, or Panoptic. 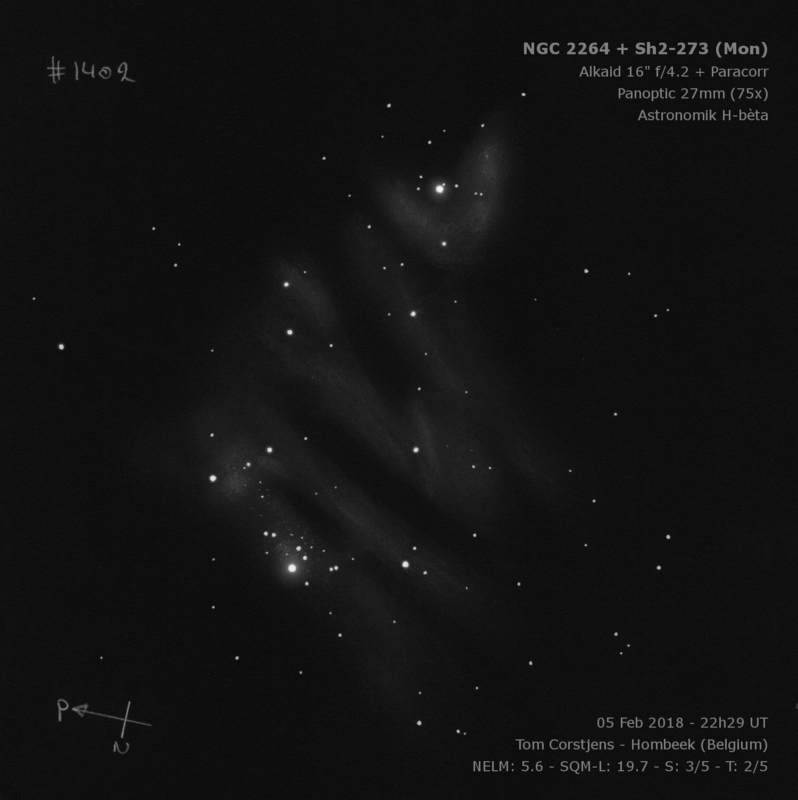 The sky condition notes include the naked eye limiting magnitude (NELM), narrow field Sky Quality Meter (SQM-L) reading, and the seeing (S) and transparency (T) according to the Antoniadi scale: 1 is good, 5 is poor. Cone / Christmas Tree / Fox Fur Nebula by DeepskyLog user Tom Corstjens licensed by (CC BY-NC 4.0). Used by permission. 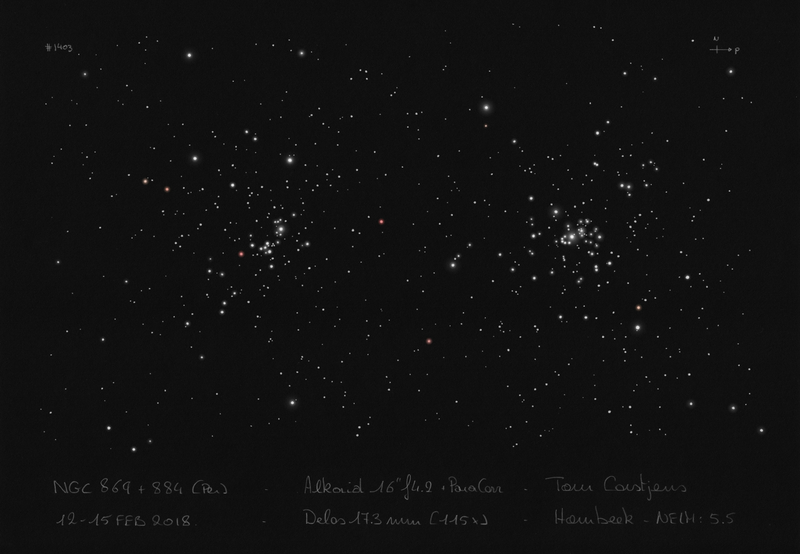 “The bright star forms the trunk of the Christmas tree and contains some nice close double stars around it; to the south is a second bright star in the top of the tree; the other bright stars make a wide triangular pattern and are about equal brightness; good contrast with the background … when I looked closely at the cluster (the first stars were already on paper), the image field seemed filled with a ghostly mist that appeared to hang over the bright stars. The first reflex was to see if there was any dew on my primary mirror — no. Moreover, the glow remained in its position when I moved the image: further away from the cluster the background became darker again.” Alkaid 16″ f/4.2 Dobsonian plus Paracorr and 27mm Panoptic eyepiece with Astronomik Hβ filter. I’m sketching with regular graphite pencil (HB, 1B and 3B) on white paper. Stars are finished with black fineliner. Then sketch is digitally scanned (flatbed), dust speckles cleaned and text is added in GIMP software. That’s it – no complex digital processing and keep the raw nature of paper and pencil. 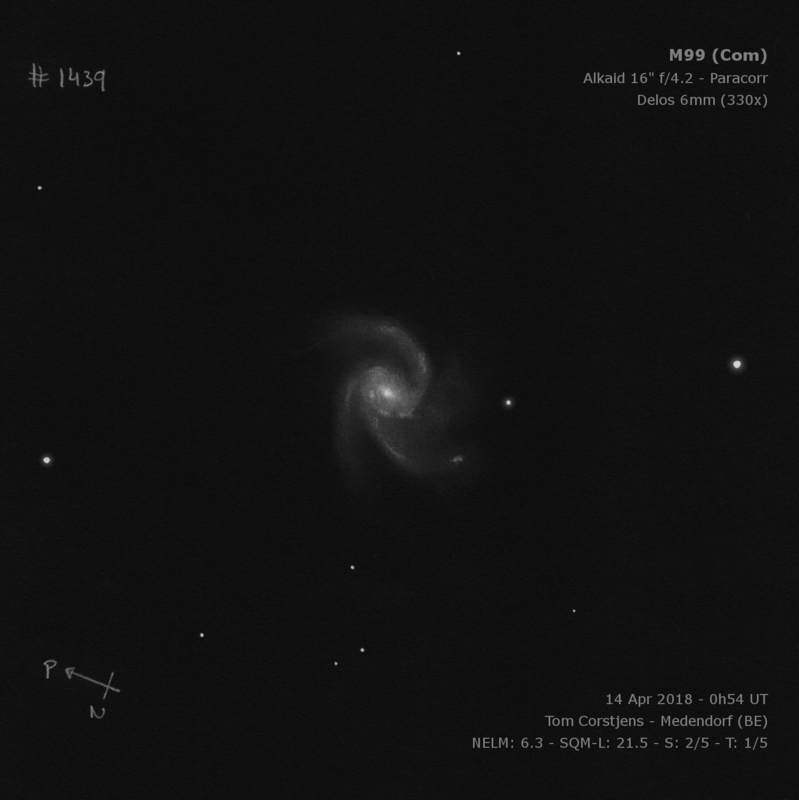 M99 Pinwheel Galaxy by DeepskyLog user Tom Corstjens licensed by (CC BY-NC 4.0). Used by permission. “At 330x magnification it became clear why they call this the Coma Pinwheel Galaxy … especially the southern spiral arm was wonderfully beautiful and immediately visible. It turns counterclockwise and a little away from the core zone. Averted vision suggests two bright patches in this arm. The edge of the core zone is very granular and on the north side there seem to be several patches. Closer observation brings out two more, fine, spiral arms, one with a short hook on the western side, close to the core and very thinly spreading northwards. On the north side of the core emerges a spiral structure and this rotates more distinctly away from the core. 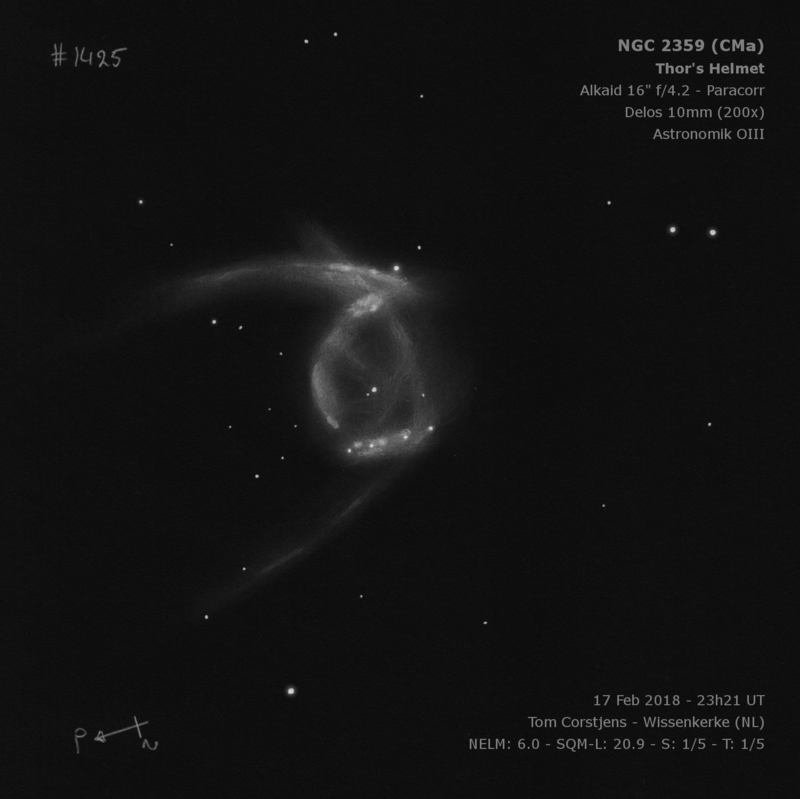 Further away from the halo a weak star seems to be on the north side, but this turns out to be a bright HII area!” Alkaid 16″ f/4.2 Dobsonian plus Paracorr and 6mm Delos eyepiece. I’m using primarily Delos eyepieces because their 72° field is ideal for sketching: full large field can be seen to the edge, but still compact enough to orientate the marker stars on sketch paper. Stars are pinpoint sharp to the edge, objects are very crisp with subtle details detectable, where other eyepieces fail to perform on this level. 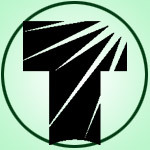 Over the past 20 years I have used various eyepieces, also Tele Vue Plössls, Nagler, and Ethos aside of other brands. The Delos series are near-perfection for me, with comfortable viewing, and adjustable eye relief blocking any indirect light. Also the dimension and weight are acceptable and do not cause balance issues on my 16″ Dob. Thor’s Helmet by DeepskyLog user Tom Corstjens licensed by (CC BY-NC 4.0). Used by permission. “Superbly beautiful complex a few degrees east of Sirius, at low magnification it is already visible as an irregular blotchy glow. An OIII filter gives a strong effect and shows that the central part is clear. The northern side is also brighter and more sharply delineated. At a higher magnification (200x), many subtle details become visible: the central part shows a bow shape to the west that contains several bright zones; inside the mist, bright filaments alternate with dark spots, with star WR7 as a bright beacon. 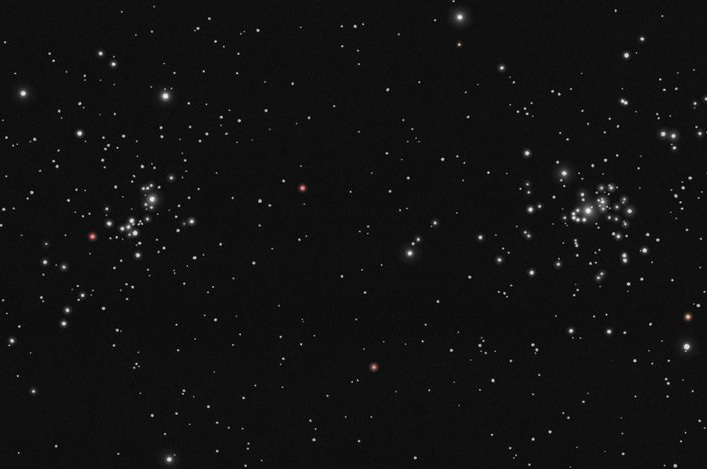 On the south side, the onset of the first horn is very bright with a maze of spots; the north side is particularly rich in detail with 4 stars in a row around which an elongated, bright fog floats with subtle spots in it. Averted vision also shows the second horn of the Thor’s Helmet, much more subtle than the southern horn.” Alkaid 16″ f/4.2 Dobsonian with Paracorr and 10mm Delos eyepiece using OIII filter. Previous Previous post: Jupiter Opposition & Mercury Tangles with Uranus!